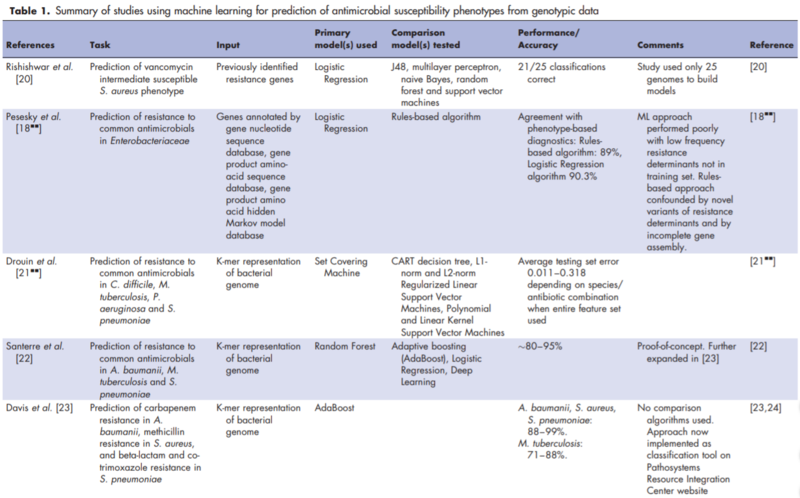 Prediction of bacterial resistance/susceptibility to antimicrobials (from genotypic data) using Machine Learning methods is a problem that has started receiving interest in recent years. To date, there has not been a consensus about the optimal machine learning model to be used for AST genotype–phenotype prediction, as reflected by the diverse algorithms authors have implemented (Table 1). Has this changed in the past 2 years? Is there now a consensus about which models are most effective? Browse other questions tagged bioinformatics microbiology theoretical-biology computational-model or ask your own question. What are the best detection medias for cholera? Is there a realistic “family tree” model for the human population? What model of epistasis best fit the reality?